The Anonymous Mint’s Lisa Parker Collection is yet another installment of beautiful silver rounds with low mintage figures. Even by the Anonymous Mint’s standards though, this collection offers extremely limited mintage figures that the mint has labeled “micro mintage numbers.” This new collection from the Anonymous Mint catalogs some of the top works from wildlife and mystical artist Lisa Parker. The second design of the collection is now available to you from JM Bullion and brings the eerie appearance of What Lies Within. Today is your chance to learn all about the latest design. For the second design in the Lisa Parker Collection, the Anonymous Mint chose her creation known as What Lies Within. The eerie scene includes a quaint little cottage in the woods with the branches of leafless trees hanging overhead the building as the light of the full moon in the night sky beams in the background. The cottage appears inviting with its front door slightly ajar and a warm glow coming from within. However, the cat sitting in the foreground offers a bit of warning to those who might approach. It sits with its head turned back staring right at you almost as if beckoning you to enter the cottage, but simultaneously sending a shiver down your spine. Is the cat inviting you in or warning you about entering? British artist Lisa Parker studied Natural History Illustration at Bournemouth & Poole Institute of Art & Design. From a young age she enjoyed expression her love of wildlife and nature using pencils in her artwork. Over time, her work grew to combine wildlife and nature with the mystical realm. Throughout her career she has worked with various mediums, including pencils, oils, and watercolors. Most of her modern works are originally completed in watercolors. 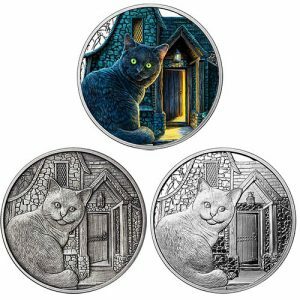 You can find her works of art on countless products from shirts and calendars to phone cases and these beautiful silver rounds in the Lisa Parker Collection.